Commercial aluminium doors are frequently used as “controlled entry doors” or for general access control. General access control requirements mean that a building needs to monitor who enters and leaves a building rather than providing general free entry and exit. Typical examples include entrance doors to apartment blocks, factories, offices, high end jewellers shops. These are typically premises that wish to ensure only authorised personnel or those with permission can enter a building. 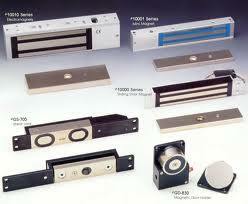 There are many magnetic locks, suitable for commercial doors each with differing install requirements. With commercial doors this means that they can either be fitted with an electric strike, or for even more security magnetic locks. A magnetic lock has two parts that connect together and keep the door firmly locked shut. Only upon electric or remove activation will the magnetic lock release and allow entry. For exit there will normally be a wall mounted push button that again activates the magnetic lock and enables the user to leave the building freely. Installation Issues with Magnetic Locks. Having to find suitable packers such as bits of aluminium, wood or plastic glass packers. A new bracket is available offering infinite adjustment for magnetic locks. The new universal bracket offers a true solution to door installers and maintenance companies. 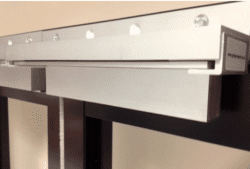 For open out doors, Gingers Spark have invented the SDGi bracket that is universally suitable for all opening outwards commercial aluminium, timber or steel doors. The major benefit to door installers of this bracket is that the typical issues with fitting and adjusting doors supplied with standard L brackets can be avoided. You may think why is this needed considering most standard magnetic locks come with their own L or Z brackets? Every site installation will be different and especially where you are dealing with lintels, plaster lines or reveals sometimes the bracket supplied with the magnetic lock as standard simply won’t fit as intended. With such diversity in site installations and conditions it is understandable that hardware suppliers won’t be able to provide a one type fits all solution. The infinite adjustment provides solutions for building owners and managers. The Gingers Spark SDGi bracket provides an infinite level of adjustment that really does help the door installer set up the magnetic lock. It offers a choice of adjustment to both the magnetic lock and armature because the bracket gives forward, backward and even angled movement and adjustment. Other Advantages of the Gingers Spark SDGi bracket. Typical access control doors such as these to a block of apartments will benefit. This new bracket offers several advantages to both door installers and building occupiers and clients. It is often the case that the door installer will do the right work in setting up and adjusting the door before leaving site. But normal use, abuse or simple wear and tear can make many doors go out of adjustment. With this particular product and with the instructions supplied it is not necessary to call the door installer back should further adjustment or correction be required in the future. A competent tradesman or door maintenance company should be able to simply re-adjust the door using the benefits of the Gingers Spark bracket. Where high security doors need adjustment and are compromising security whilst a door maintenance company has been called out, this provides a quick and easy solution. The magnetic lock components that are not locating properly can be adjusted and the door made secure far quicker. The bracket also offers advantages should your supplier either offer doors ready fitted with all the magnetic lock components or pre-drilled to accept them. Either way the SDGi bracket can save any door installer valuable time solving adjustment and installation issues. This is a great product for any commercial door installer, door maintenance company or other business that specialises in doors, access control or security. Please contact us for further information. 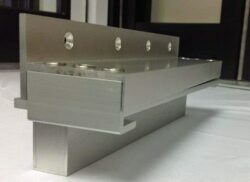 I would like to evaluate the SDGi bracket to see if it will be suitable for some of our applications where maglocks are used on aluminuim doors. Can you supply more details about the SDGi bracket? Please use this form to get in touch or ask questions. Please provide the first part of your postcode. You can upload technical or other drawings here. (please note that there is a 2MB limit. Accepted file types: jpg, pdf, tiff, tif, png, jpeg. Aluminium Trade Supply is the 1st and No.1 aluminium window and door information resource with news and comment on the double glazing industry. We promise that we will not pass your details to a third party. And never send spam.